Outdoor fireplaces can add charm and comfort to any outdoor living space. They can be built on decks, sunrooms, patios, or porches. Once you’ve chosen to add an outdoor fireplace to your Chapel Hill, Durham, or Raleigh-area home, deciding upon the placement is the first step in the design process. You’ll also want to consider the benefits and options between gas and wood-burning fireplaces, and the variety of design options that come with each. 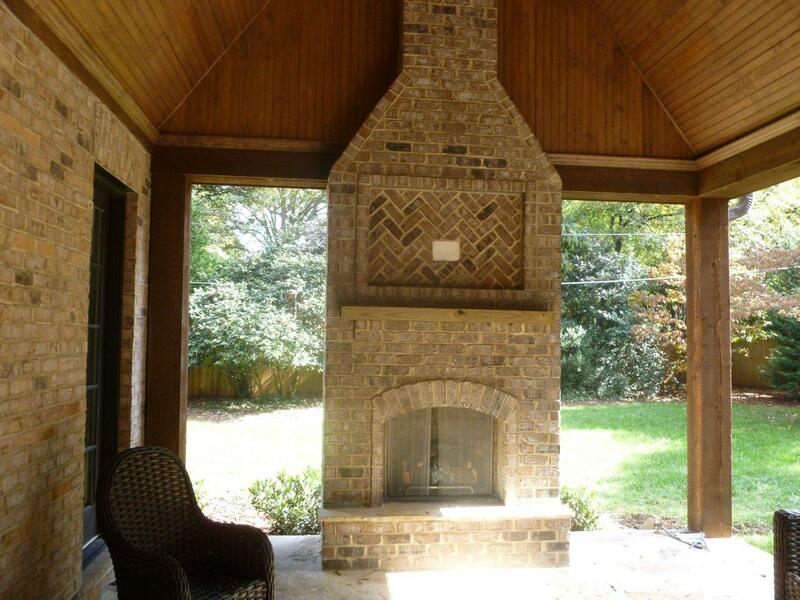 At Archadeck of Raleigh Durham, we find that porches are the most popular place for outdoor fireplaces. 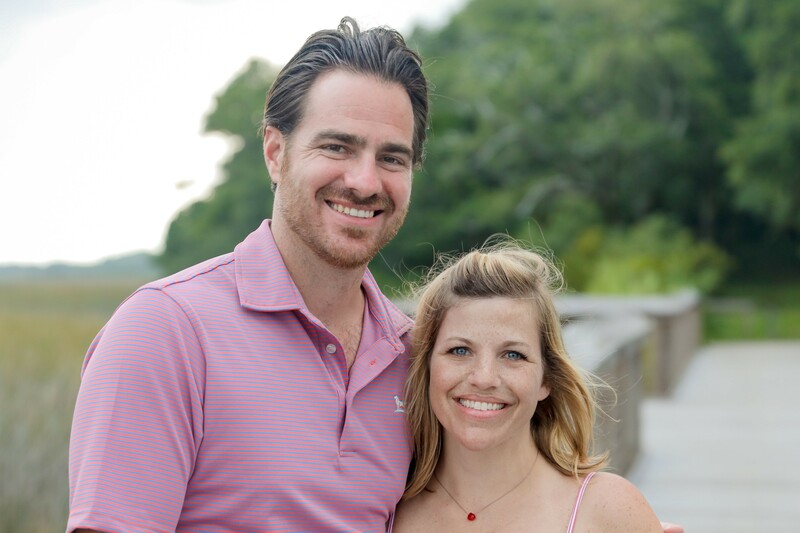 Our clients love to enjoy family time, entertaining, or unwinding after a busy day on their open or screened porches. 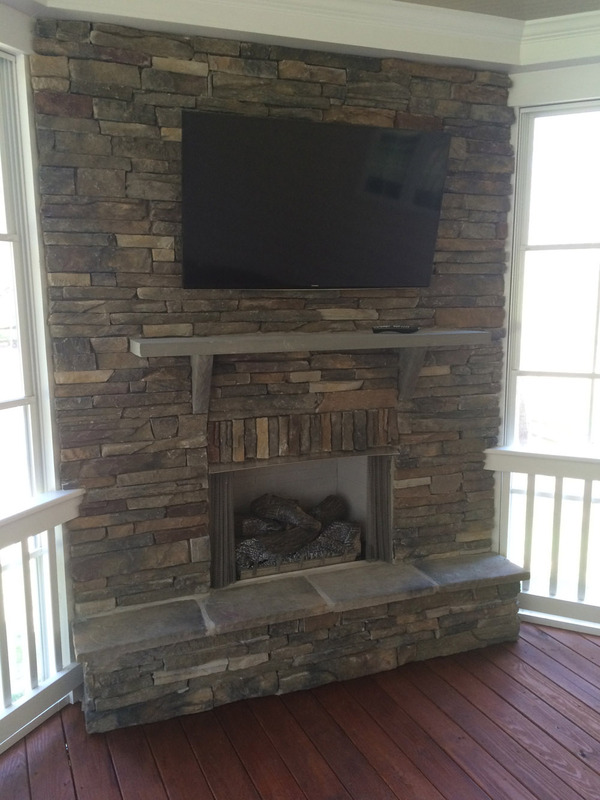 Adding an outdoor fireplace makes the space usable throughout more months of the year. In addition to providing warmth to chilly air, fireplaces can also become a social hub and visual focal point for the porch. Fireplaces can be added to existing porches to give the space a totally new feel, or incorporated into the original design of a new space. Choosing the placement of your porch fireplace is a big decision. Corner fireplaces are popular but they can take up a great deal of floor space. If you place your fireplace along a wall, you’ll keep more livable space on the porch. Another important consideration is visibility to your yard. You want to make sure the fireplace doesn’t obscure your favorite view. Similarly, the fireplace can function as a privacy wall if there’s a particular area outside the porch that you’d rather not see. Another important decision in planning your new porch fireplace is whether you want it to burn gas or wood. Each type has unique benefits to consider. Gas fireplaces are the most cost effective and convenient to use. They can be turned on by a simple switch, and many come with a remote control you can use from the comfort of your outdoor sofa. Gas fireplaces are typically considered safer, require less additional structural support, and have less stringent code requirements than wood-burning ones. Although gas-burning fireplaces offer many benefits, classic wood-burning fireplaces will never go out of style. Nothing quite compares to watching the ever-changing flicker of flames and listening to the crackle of burning wood logs. And the nostalgic appeal of campfire smell – who can resist? As for functionality, if you’re looking to warm up a 3-season porch for winter use, wood-burning fireplaces emit more heat than gas fireplaces. Fireplaces with inserts are typically less expensive than traditional fireplaces and offer more versatility in design: they can be built in a wider range of places, they have more ventilation options, and they come with more façade choices. For example, in addition to brick and stone, you can use wood or siding. You can choose to cover all the fireplace’s sides in the same material or use one type of material for the inside and then have the outside match the home. Stainless steel inserts are typically used to prevent rust and corrosion. Although they do add a bit to cost, they will provide many years of lasting performance. Another style option is to use gas or wood-burning stoves rather than fireplaces. Stoves take up less space and have a somewhat rustic or vintage appeal. You can also create a special backdrop behind the stove for visual effect, such as a stone or tiled wall. Fireplace façade options abound, but stone remains quite popular. Choose from natural or cultured stone to fit your budget, style, and lifestyle. Stone façades can add tremendous visual interest and an upscale look. For the hearth, choose from marble, flagstone, recycled granite, slate, limestone, or a number of other man-made or natural stone options. Mantel options allow design inspiration to flourish. From classic stained oak with decorative moldings to a marble slab or repurposed antique barn wood, your outdoor fireplace can be fully customized to your liking. For more outdoor fireplace design ideas, visit our gorgeous Fire Features gallery.